Warning! Don’t read Josh Tillman’s, a.k.a. 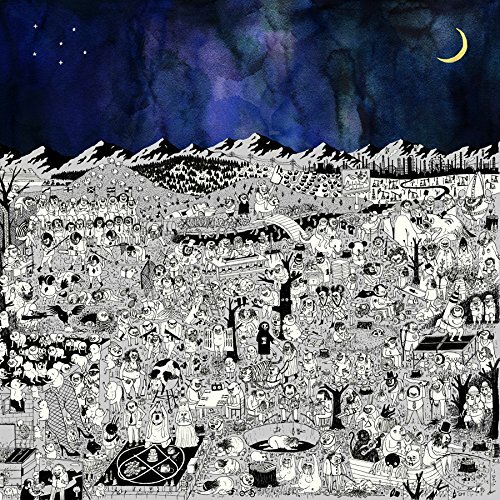 Father John Misty’s, expansive treatise about his new album before listening to it. The rambling six-page, 1,770 word document attempts to explain the concept behind this equally sprawling 13 track, 75 minute follow-up to his critically acclaimed 2015 I Love You, Honeybear release. It contains sentences such as the opening “Pure Comedy is the story of a species born with a half-formed brain. The species’ only hope for survival, ﬁnding itself on a cruel, unpredictable rock surrounded by other species who seem far more adept at this whole thing (and to whom they are delicious), is the reliance on other, slightly older, half-formed brains.” That’s the most cohesive it gets. Better to just push play and get transported into Misty’s world where ’70s Elton John, piano based ballads meet Harry Nilsson’s skewed lyrics with indie rock attitude. Like his dissertation, trying to decipher what exactly is going on in these lyric-heavy tunes that seem to describe a dystopian society may be worth your time, but only after you digest the equally challenging music. Look no further than attention-grabbing song titles such as “Things It Would Have Been Helpful to Know Before the Revolution,” “When the God of Love Returns There’ll be Hell to Pay” and the 10-minute long “So I’ll Stay on Magic Mountain” to get a sense of what you’re in for. Thankfully, Misty’s dreamy voice meshed with similarly attractive melodies that never seem obvious or nearly as oblique as the concepts they convey keeps this project not just afloat, but moving forward despite, or perhaps because of, the widescreen production that features symphonic horn charts and voluminous strings. Rather than drowning these tracks, they elevate them to artistic levels made all the more impressive knowing they were done live in the studio with no more than two live takes each. There is no rock here, although the prog nature of the music incorporates those influences, yet the album never feels bloated or one-note. Those willing to navigate songs with verses like “And hand me a sea-peach/ and say “Come over here” from the Pink Floyd-sounding “Smoochie,” which seems to be as much a love song as it is an acceptance of the narrator’s madness … or something, can glide on the song’s lovely, subtle, melodic grandeur. Regardless, in this era of easily digested ideas made for short attention spans, Father John Misty challenges his audience to stick with him on a rewarding hour and a quarter slo-mo journey to a sphere that may share a few too many comparisons to ours for comfort. Jump on, relax and enjoy the ride.